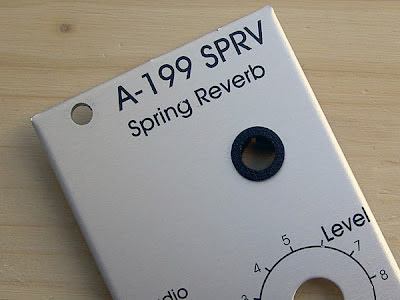 Two easy Doepfer modifications: a port-hole for the A-199 Spring Reverb and another cap change for the A-162 Dual Trigger Delay. Like many A-199 users, I keep my tank outside my case. It's less noisy and means I can play the springs. Until today, this meant an ugly, useless 1HP gap next to the module to allow the cinch cable out of the box. Once drilled and threaded, the hardest part was feeding the cinch back under the second cable tie before soldering. I gave up, snipped the plastic tie and used one of those twisty things everyone has lying around the kitchen. It's such a simple, useful mod - maybe Doepfer could be persuaded to offer it as an option? The 1uF gives a maximum of around one second delay time. This is more appropriate for echo-type delays. Depending on the frequency of the incoming trigger, higher settings can still be used to generate clock divisions, audible as 'missed/ skipped' notes in the above recording. 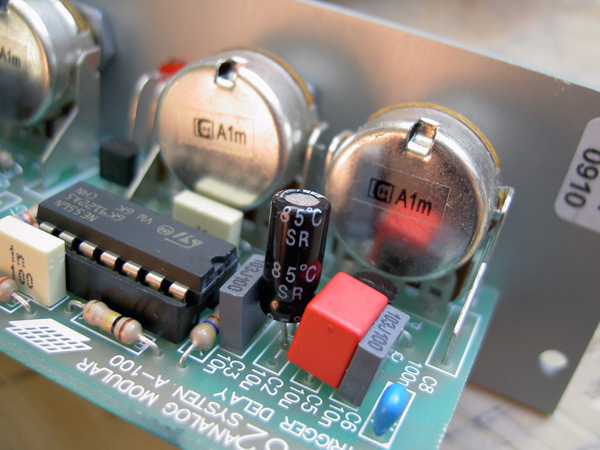 It's another simple mod that enhances the use of this module. To be honest, I don't know why the A-162 comes fitted with such large caps as most musical uses lie within the first 10% of the pot's throw.